The first component of ZM is the toolbar section. It is comprised of the following toolbars with their respective tools. This toolbar has the buttons shown in the image below, with descriptions of each button and more information after the image. Create new file: Obviously, creates new file (if you open ZMod, it automatically starts a new file). Open existing file: Opens a previously-saved ZMod file (see "Save" below). Save: Saves the file. Format is saved as a ".z3d scene" file. When clicking this button, it saves all textures, models, views, and other setups used in the file. Import model: Imports 3D model files. You can choose from model types for various games. GTA SA uses the .DFF format model. Export model: Exports your model when you are done. This is the model (.DFF file) that you then load into your GTA3.IMG file. Be careful to select the correct properties when exporting. Materials editor: Opens the editing menu which allows you to change material properties (such as transparency, reflections, textures, and color). Texture browser: Brings up the list of textures currently in the model. From here you can add or remove textures. Undo: Undoes the previous action. Undo list: A list of the previous actions in consecutive order. Redo: Redoes an action that was undone. The editing levels toolbar lets you pick what exactly you want to select and modify. To enter a specific editing level, you must select it, then click on the part you wish to edit. The part will highlight blue when hold your mouse over it. Point manipulator: I don't think I have ever used this, so I have no idea what it is used for. 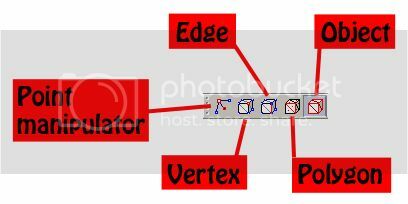 Vertex select: Picks individual points (or vertexes) to modify. By holding shift key, you can select multiple points. Edge select: Selects edges of objects. Polygon select: Selects polygons. These could be triangles or quads, it doesn't matter. You may have to use a polyline selection technique to select multiple polygons (I'll explain later). Object select: Selects whole objects. When you are using one of the other selection tools, you will probably accidentally click on the wrong object now and then. You will have to click the object selection button and then click on whatever selection tool you were using before you screwed up. It is hard to explain in text, but you will see what I mean after you eventually screw up . This toolbar is pretty important to understand. It allows you to use tools and view windows to their potential (more on that later). Pull-Down Menu: There are 3 options in the pull-down menu: World, local, and screen. These options choose between which coordinate system is being altered. I usually use the 'Screen' option. 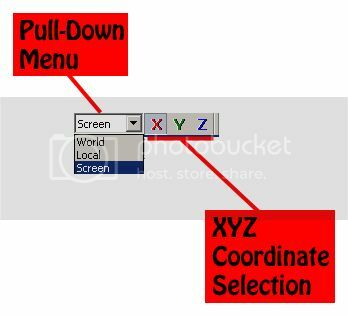 This means that the XYZ coordinates in each screen selected will be altered. To explain this fully, I will need to explain the coordinate system, which will be done later. XYZ Coordinate Selection: Selects between the 3 coordinate directions (X, Y, and Z). By having one or two of these options selected, it allows you to use tools in those directions. For example: If I had only the X direction selected and I was using the 'Move' tool, I could move objects only in the X direction (left and right in any given window). However, if I had only the Y direction selected, I could move objects up and down in any window. Likewise, if only Z was selected, I could move objects in and out of the screen in any window. When in an editing window, you can select both X and Y coordinates. This would allow you to move objects in both the X and Y directions (left/right and up/down) simultaneously. You can't, however, select the combinations of both X/Z or Y/Z at the same time. Always keep this toolbar in mind when editing models. 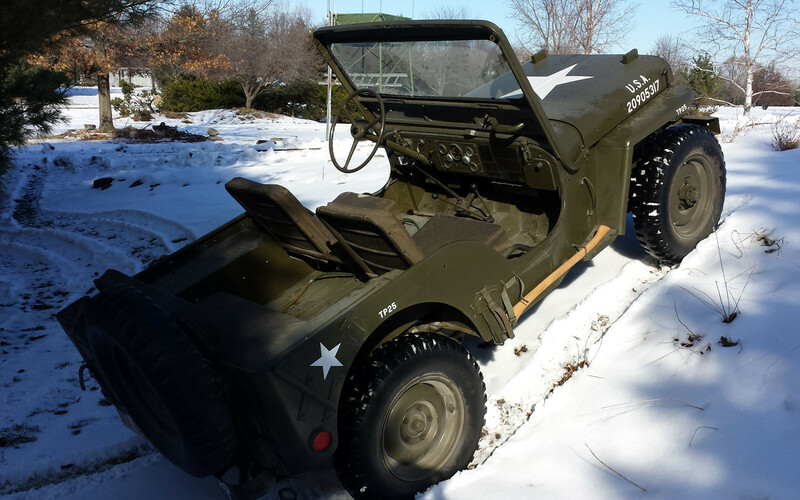 It is extremely important to be able to move objects exactly in certain directions. Sometimes, you only want to move a part up a bit, but don't want to disrupt its left/right alignment. This toolbar lets you snap the cursor (and respective tools) to various parts of objects. Enable/Disable Snapping: By clicking this, all snapping options will be toggled. When the button is blue, snapping is enabled. Edge Snapping: By having this button enabled, your cursor and tools will automatically snap to the edges of objects. 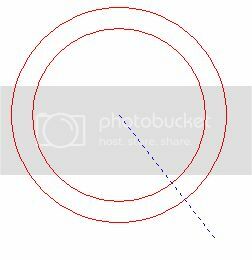 Point Snapping: Similar to edge snapping, point (or vertices) snapping will snap the cursor to points on the objects. Grid Snapping: When the grid is enabled (explained in the 'Display Options' section), the cursor will snap to corners of the grid. I don't find this option very useful and therefore I hardly ever use it. Since most of the objects are created in the same manor, I'll only show a tutorial on how to create one type of object. That object is a 'Tube' object. To begin, be sure the 'Auto' button is deselected (it should be grey) in the lower right corner of the screen. 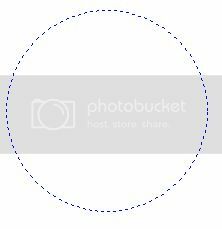 This button can be seen in the very first image above (in this image, it is blue which means 'Auto' is selected). select the 'Tube' object from the pull-down menu. You can change all of the options in this menu. The most important thing to take from the menu is the option I highlighted in blue, 'Cross points'. 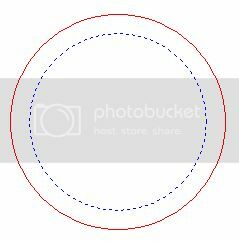 This option changes the number of flat sides of the circles. The next screenshot shows the finished product of the tube created in the tutorial. Take note that there are 8 sides to the tube, because we selected this value for the 'Cross points' in the previous menu. 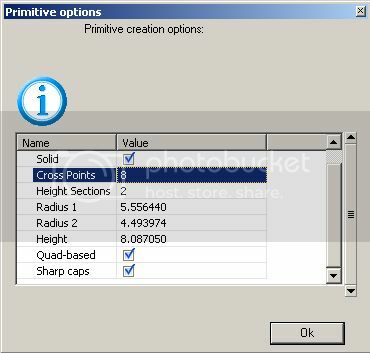 By using this method, or one similar to it, you can create all of the objects in the Primitives toolbar pull-down menu. This concludes the section of toolbars.